Thanks to everyone who came out to our 6th anniversary at the weekend.. a great time was had by all! Special thanks to all the djs that played on the night, some great sets! 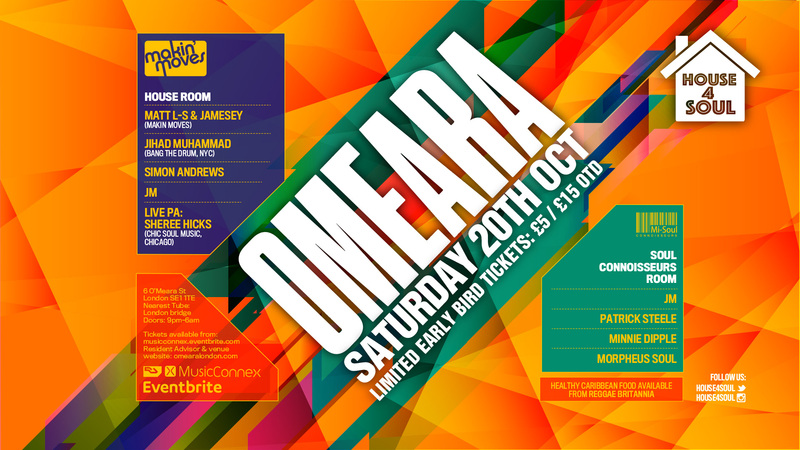 Moving swiftly on to next month, Saturday 20th October we welcome two heavy weights to House 4 Soul!! Our very good friend DJ Jihad Muhammad from New York and singer sensation Sheree Hicks from Chicago!! Jihad hails form New Jersey and is on one of the best DJs on the planet, his sets are electric and mixing skills are second to none. He’s been in the music industry for over 40 years, brought up listening to great djs in NYC such as Timmy Regisford, Louie Vega. He has his own event Bang The Drum which he runs every month in New Jersey and also runs Movement Soul a very creditable dance music label. He’s also been part of our Makin’ Moves HouseFM.net show every month doing a month segment so we know many of you are itching to see him live! We’re very excited to welcome him back to London as its been 4 years since we last had him over. Also, flying in from Chicago we have Sheree Hicks! This woman is one of the hardest working in the music in industry and has numerous hits on her music CV! Starting early singing in church she was picked up by Def Jam to make up a girl band at the tend age of 17! Since then she has gone on to write for the likes of Backstreet, heavy D and C&C Music Factory. One rnb jam she wrote was remixed by Maurice Joshua and soon she working with all the best house music producers around town including Terry Hunter Josh Milan, Beloved Tennant, Jihad Muhammad, DJ Spen, Vick Lavendar, and of course Jihad Muhammad! Sheree currently runs Chic Soul Music currently working with DJ Pope, Beloved, Sean Ali plus many more. She will be performing a PA of some of her hits over the years! We’ve also got some amazing DJs In the soul room and tickets are only a mere £5 at the moment!